Are you ready to take control of the fun chaos created at bath time? Kids love bath time with toys but, as you know, the bathroom usually ends up looking like a war-zone – covered in toys and water! Well, the good news is our mesh toy net is the best and biggest bath organization solution there is! 14″ x 20″ capacity holds a lot of toys! Vagabond Baby Bath Organizer keeps your bathroom clean, bright and mess free – all the time! It keeps toys dry and clean too. Bath toys can end up getting all slimy and gross when kept lying around or in a basin. Mold is dangerous for you and your child! But because our netting is specially spaced out, there is plenty of room for air to circulate while all the water drains out leaving toys clean hooks and dry with no mess! 2 super strong suction cups. Our suction cups ‘lock” once you move the hook down which means your bath storage net will stay stuck to the wall without constantly falling off! PLUS 2 Extra Suction hooks and 4 BONUS 3M disc stickers just in case you need extra strong holding power. Great for the Entire Family! During bath time, little ones enjoy being able to see and point to the toys that they want. They also have fun putting toys away when bath time is over. The Vagabond Baby Bath Organizer is also a great choice for grandparents looking for an easy way to store their grandchild’s bath toys. Click Add To Cart today to get this wonderful solution for your current or future bathroom clutter. It makes for a great family or baby shower gift. 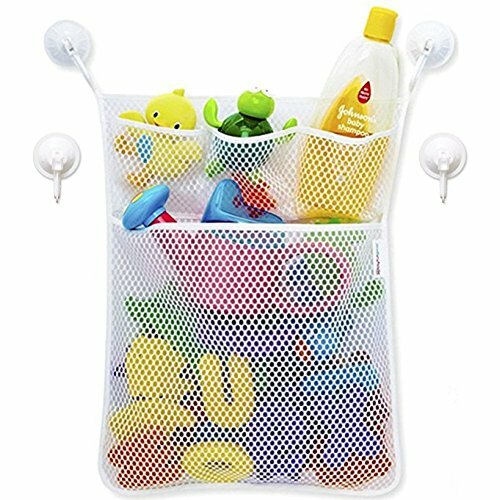 *BABIES & KIDS HAVE FUN ORGANIZING BATH TOYS – Both Boys & Girls love to play a game and help Mom and Dad put away bathtub toys where they can see them in the mesh organizer. *MOM & DAD LOVE IT – 2 EXTRA hold fast locking suction hooks & BONUS four 3M disc stickers for extra hold -The white mesh net bag easily mounts to any wall or tucks into a corner for maximum storage. Like a toy hammock, the air circulates through keeping your kids’ toys nice and dry. Big kids like hanging it on a hanger like a shower caddy, use it in RVs, boats and laundry rooms to stay organized. *BPA FREE MOLD RESISTANT POLYESTER MESH Great to use anywhere in the house, garage, RV. *VAGABOND BABY BATH ORGANIZER is Mom and Dad’s Little Helper with many uses: Extra storage for bedroom, garage, kitchen, linen closets, camping, boating, car organization, toy bin, video games, tech devices, travel packing compartments.toiletries, make-up, portable camping shower caddy. Simple, yet super functional! Great Organizational product.! Simple, yet super functional. You have the option of either suctioning it to your shower wall or sticking it with the adhesive sticker on your wall, or crib, or next to your couch or wherever else you may need a place to store your items in a handy location. Fabulous Organizer! Quality Product going to buy more for my toy room. Great quality product that will last! The product has three smaller pouches which I use to store baby shampoo and smaller items. The larger pouch I use for toys and a water spout gadget I use to rinse my daughter’s hair off. Great product! Oh, the additional adhesives stickies are a plus as well! This product will be good in my playroom as well. Great Bathtub Toy Organizer for the Family This Bathtub Organizer is Great! Keeps all our bathtoys in place and makes our clutter look organized. Thank you, highly recommend.